Your home deserves to be gorgeous. Luckily, if you schedule a KIWI Services carpet cleaning in South Houston, your home can be beautiful all year long without putting a dent in your wallet thanks to the KIWI Lover One–Year Carpet Cleaning Warranty. KIWI Services is a proud green cleaning company that promises to only use all-natural ingredients in our carpet cleaning solution and never add any harsh chemicals, so that our services are always safe for the whole family. KIWI also chooses to use the environmentally friendly dry carpet cleaning method, which produces no wastewater and dries in 15–45 minutes. 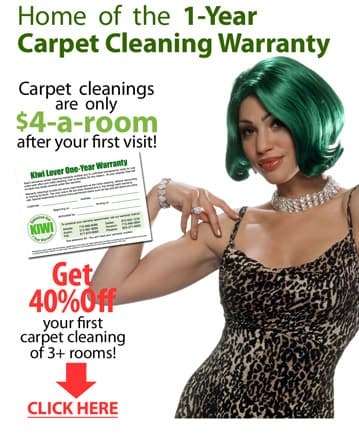 We promise to get you back onto your carpets and your life faster than the other guys. The KIWI Lover One–Year Carpet Cleaning Service is for those South Houston customers who spend $120 or more on their initial carpet cleaning appointment. The warranty gives a full year of unlimited $4 per room cleanings, plus a $37 trip charge. KIWI will come back to re-clean each time you spill, before every event you host, or just every time you miss the fresh citrus scent of our carpet cleaning solution. To schedule a service or to receive more information about one of our other home care services, call the Houston area KIWI Services Center today!